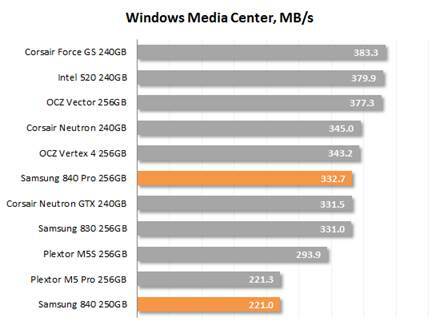 Unfortunately, SSDs do not always work as fast as in their "fresh" state. In many cases their performance goes down after a while and in real life we deal with completely different write speeds than what we see on the diagrams in the previous chapter of our review. The reason for this phenomenon is as follows: as the SSDruns out of free pages in the flash memory, its controller has to erase memory page blocks before saving data onto them, causing significant delays. Thus, modern SSDs usually try to free memory in advance, and not when writes are underway. This process usually occurs in the idle mode. At this point the SSD controller can alleviate the performance drop almost completely by erasing unused flash memory pages ahead of time. The corresponding step is usually performed in idle mode, when the controller can fully restore SSD performance by clearing out the unused flash memory pages. They used two techniques for this process, it is: idle-time garbage collection and TRIM. A SSD controller does not know which memory pages contain user data and which are considered available by the operating system. It happens this way because in file systems removing a file doesn’t involve its actual physical removal. Instead, the corresponding memory is marked in the file system as available for rewriting into. So, not related to the operating system, a SSD controller can only pre-erase pages in the reserve pool (if it exists), which is not accessible by the operating system. For a better solution to this problem, modern operating systems that have TRIM command will improve the garbage collection efficiency. TRIM provides SSD controller with information on which data could potentially be removed without any harm, because it is considered unused by the operating system. As a result, the SSD controller can increase the cleared pages pool by physically removing unneeded data so that the user didn’t feel a performance hit during subsequent write requests. This is how it will be in the ideal conditions. However, in real life, SSD differs in their garbage collection and TRIM implementation. That’s why we check out the performance hit an SSD suffers when transitioning from its out-of-box (the flash memory is clean) to steady-state. This test follows SNIA SSSI TWG PTS instructions, which means we measure the write speed in four cases one by one. First we measure the speed of SSD "fresh". Then we measure the speed after the SSD is fully filled data twice. The third test occurs after a 30-minute break during which the controller can partially restore performance by running the idle-time garbage collection. And finally, we measure the speed after releasing a TRIM command. We ran the tests in synthetic IOMeter 1.1.0 RC1 benchmark, where we measure the random write speed when working with 4 KB data block aligned to flash memory pages at 32 requests queue depth. The testing data were pseudo-random. 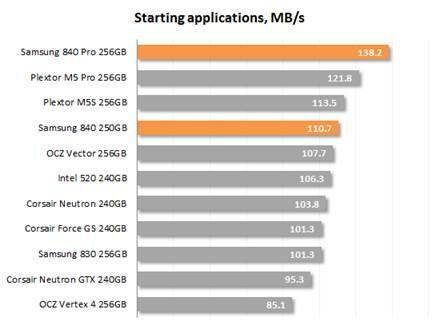 The chart below shows the history of the relative speed changes, where 100% refers to the SSD performance in "fresh-out-of-box" state. The diagram suggests that the performance degradation problem only plagues SandForce products. The remaining SSDs can restore their activity after receiving the TRIM command from the operating system. That is true for Samsung Pro 840 and 840. Their speed is restored as expected. 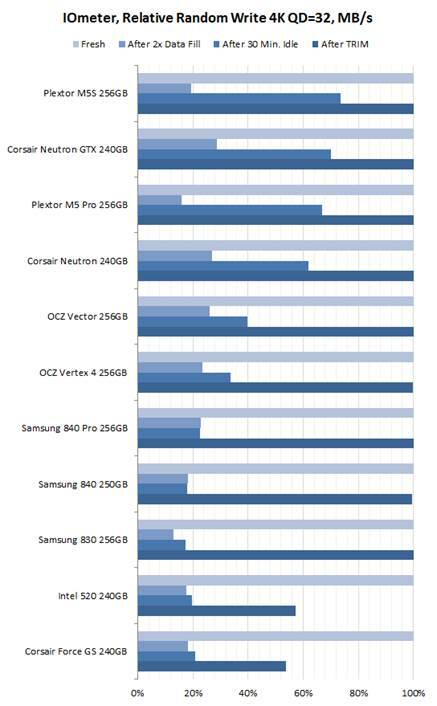 Therefore, these SSDs are not susceptible to performance degradation in the majority of modern OSes. On the other hand, garbage collection does not work on the new Samsung drives without TRIM command, this should be taken into account by users of non-TRIM environments. Samsung Magician's utility can be used to send TRIM commands to the drive manually, but it only exists in Windows-compatible versions. So, if you have some problems with TRIM support, you can choose other products such as Plextor or Corsair drives with LAMD controller. The popular PCMark 7 contains an individual disk subsystem benchmark. It is not a synthetic test, but based on the real-life applications. This benchmark reproduces typical disk usage scenarios and measures how fast they are completed in popular tasks. Starting with version 1.4.0, the PCMark 7 disk subsystem test generates raw performance result without taking into account any delay in the requests queue. 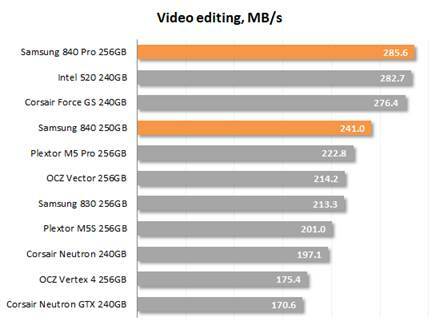 Such new results are not compatible with the old ones, but the difference between the performance of the various SSD drives are now becoming clearer. That's why we decided to switch to a new version of the test session from now on. 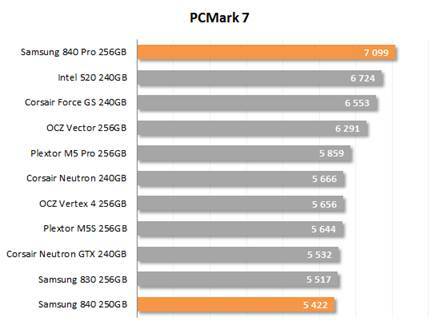 We ran PCMark 7 on "steady" SSDs, which is what they are going to be in actual computer systems most of the time. Their activity in this case is affected not only by the controller or flash memory speed, but also by the efficiency of their internal algorithm against the performance degradation. 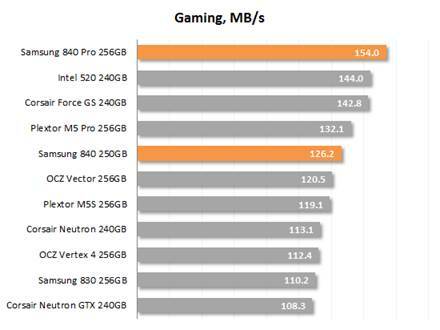 The Samsung 840 Pro is the first SSD to beat SandForce-based products in PCMark 7, this benchmark being very favorable to the SandForce controller. 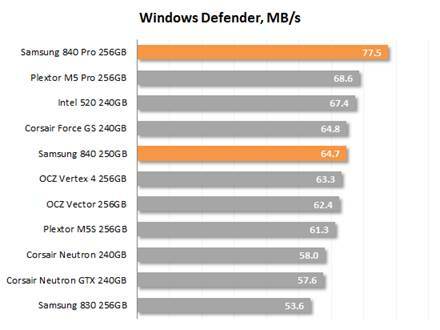 This is an important victory to demonstrate the power of Samsung's new SSD platform. The Samsung 840 with TLC flash, by contrast, at the bottom of the chart, even losing to its 830 series predecessor. The Samsung 840 Pro proves its premium class again. It takes the lead in the most important usage scenarios and only falls behind its opponents when it comes to processing small multimedia files. The basic Samsung 840 behaves in a similar way but with lower speed due to its TLC NAND flash. 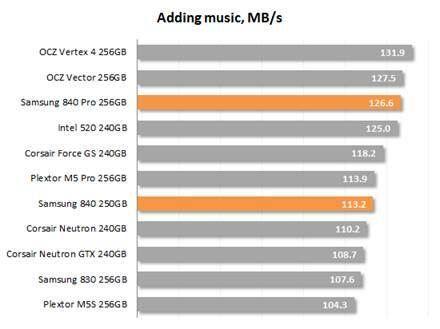 Thus, the poor overall score of this SSD is defined by its low performance with audio files and images. 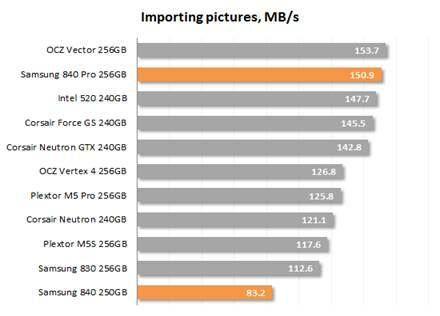 When it comes to the script or system to handle large files, the Samsung 840 is purely a product of average performance, even compared to OCZ Vector or Corsair Neutron GTX.